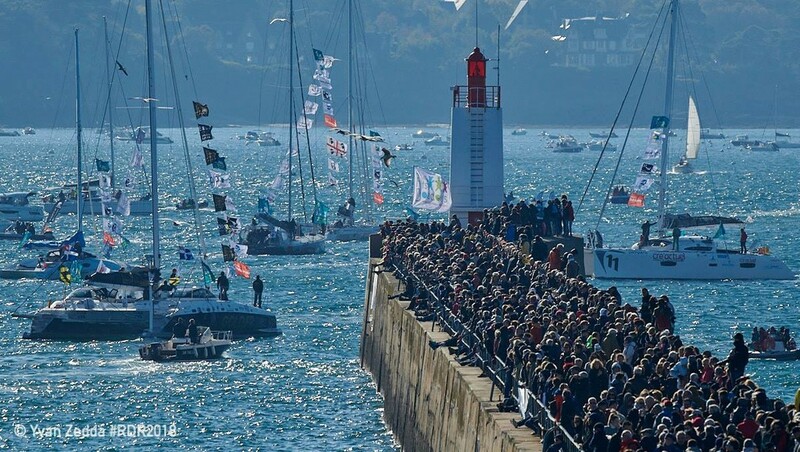 Conditions could not have been better for spectators and sailors alike at the 11th edition and 40th anniversary staging of the Route du Rhum-Destination Guadeloupe. The fleet revelled in 20 knots of breeze coming off the land on a beautiful Autumn afternoon as the solo transatlantic race got underway in spectacular style today off the Brittany port of Saint Malo, as a record entry of 123 skippers set sail for Guadeloupe. It is thought that some of the skippers in the slower classes will decide to head for refuge in ports west and south of Saint Malo – like Roscoff or La Rochelle – and prefer to wait for the weather to ease, rather than risk damaging their boats early in the piece. Race rules permit them to make a stop of this kind without penalty. At the gate at Cap Fréhel the fleet leader was Seb Josse who is awarded the Trophée du Cap Fréhel Banque Populaire Grand Ouest. But he had François Gabart in MACIF on his tail with Armel le Cleac’h in third place not far behind on Maxi Solo Banque Populaire. In the 20-strong IMOCA class Riou was still setting the pace on his orange PRB, now fitted with foils, with his fellow countryman Jérémie Beyou second on the brand new Charaland then Boris Herrmann’s Malizia II – Yacht Club de Monaco in third place.